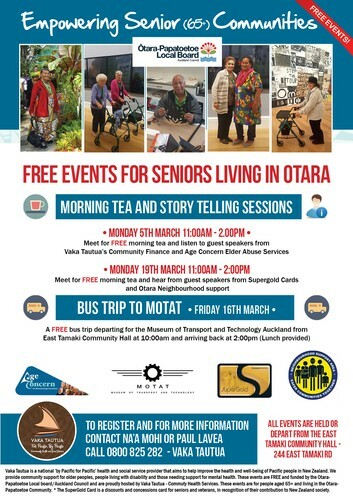 Vaka Tautua is hosting 3 free events for Seniors Living in Otara (aged 65+). These are funded by Otara-Papatoetoe Local Board/ Auckland Council. Meet for free morning tea and hear from guest speakers from Supergold Cards and Otara Neighbourhood support. A free bus trip departing for the MOTAT from the East Tamaki Community Hall at 10:00am and arriving back at 2:00pm (Lunch provided). Please note all events are held or depart from the East Tamaki Community hall - 244 East Tamaki Rd, Otara. To register for these free events please contact Vaka Tautua on 0800 825 282.